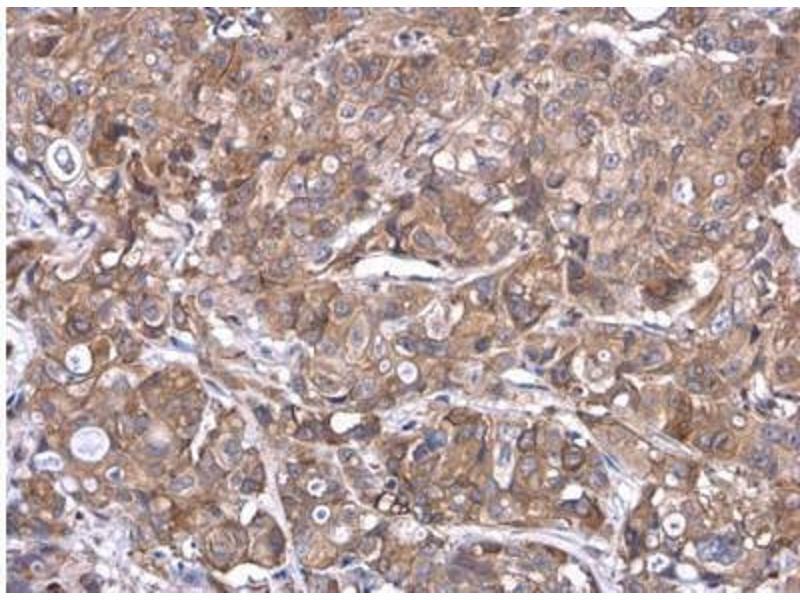 Immunohistochemistry-Paraffin: TMPRSS11D Antibody [NBP2-20668] - Immunohistochemical analysis of paraffin-embedded Breast ca, using antibody at 1:250 dilution. 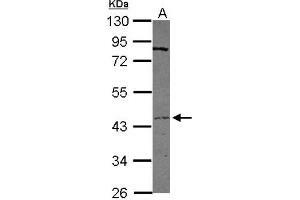 Western Blot: TMPRSS11D Antibody [NBP2-20668] - Sample (30 ug of whole cell lysate) A: HepG2 10% SDS PAGE gel, diluted at 1:500. 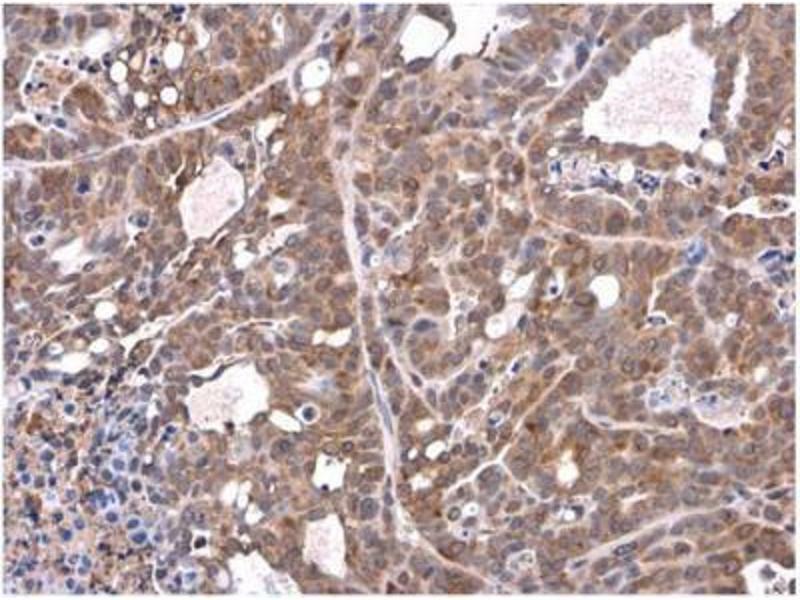 Immunohistochemistry-Paraffin: Airway Trypsin-like Protease/HAT/TMPRSS11D Antibody - Paraffin-embedded NCl-H1299 xenograft. 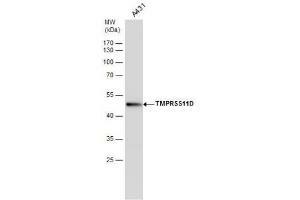 TMPRSS11D antibody diluted at 1:500. 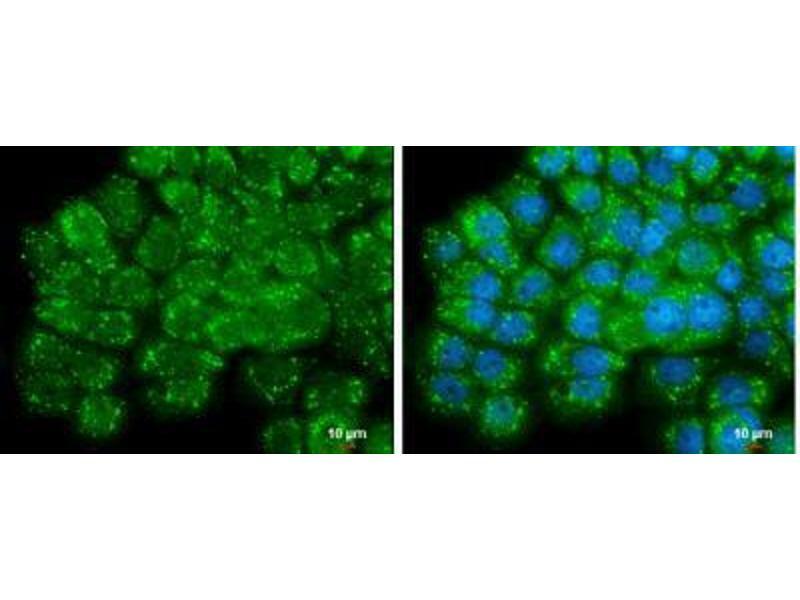 Immunocytochemistry/Immunofluorescence: Airway Trypsin-like Protease/HAT/TMPRSS11D Antibody - : A431 cells were fixed in 4% paraformaldehyde at RT for 15 min. 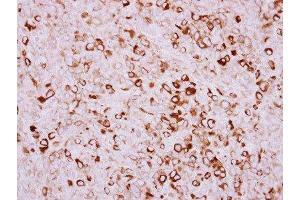 Green: TMPRSS11D protein stained by TMPRSS11D antibody diluted at 1:500. Blue: Hoechst 33342 staining. Scale bar = 10 um. Western Blot: Airway Trypsin-like Protease/HAT/TMPRSS11D Antibody - Whole cell extracts (30 ug) was separated by 10% SDS-PAGE, and the membrane was blotted with TMPRSS11D antibody diluted by 1:500. 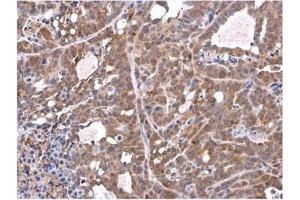 Immunohistochemistry-Paraffin: Airway Trypsin-like Protease/HAT/TMPRSS11D Antibody - Paraffin-embedded MCF7 xenograft. 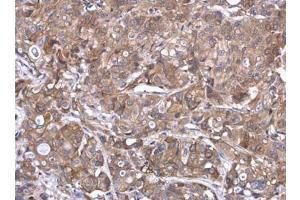 TMPRSS11D antibody diluted at 1:500. 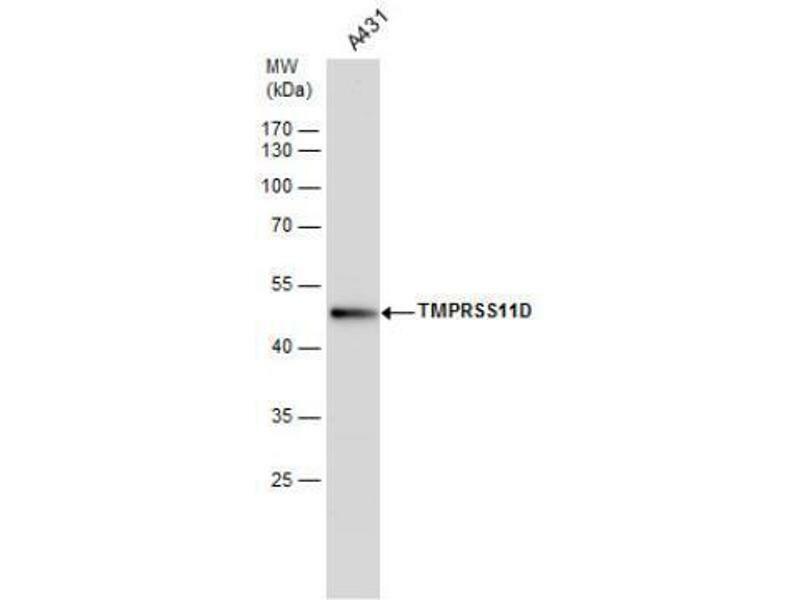 Immunogène Recombinant protein encompassing a sequence within the center region of human TMPRSS11D. The exact sequence is proprietary. 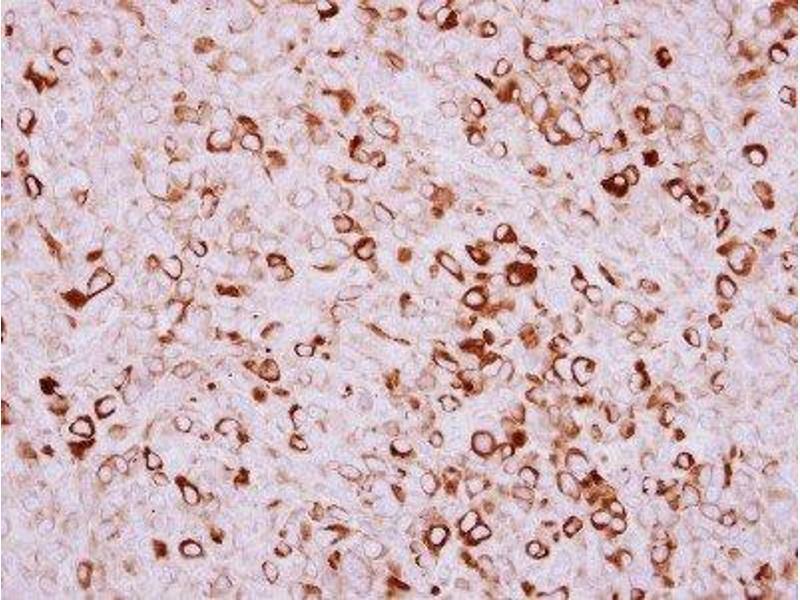 Indications d'application Western Blot 1:500-1:3000, Immunohistochemistry 10 - 1:500, Immunocytochemistry/Immunofluorescence 1:100-1:1000, Immunohistochemistry-Paraffin 1:100-1:1000The observed molecular weight of the protein may vary from the listed predicted molecular weight due to post translational modifications, post translation cleavages, relative charges, and other experimental factors. Stockage commentaire Aliquot and store at -20°C or -80°C. Avoid freeze-thaw cycles.